Automated external defibrillators can help save lives during sudden cardiac arrest. However, even after training, remembering the steps to use an AED the right way can be difficult. In order to help keep your skills sharp, we've created a quick step-by-step guide that you can print up and place on your refrigerator, in your car, in your bag or at your desk. This way, you can review the AED steps any time, at your convenience, and keep them fresh in your memory. These AED steps should be used when caring for a non-breathing child aged 8 or older who weighs more than 55 pounds, or an adult. 1Turn on the AED and follow the visual and/or audio prompts. 2 Open the person's shirt and wipe his or her bare chest dry. If the person is wearing any medication patches, you should use a gloved (if possible) hand to remove the patches before wiping the person's chest. 3 Attach the AED pads, and plug in the connector (if necessary). 4Make sure no one is, including you, is touching the person. Tell everyone to "stand clear." 5Push the "analyze" button (if necessary) and allow the AED to analyze the person's heart rhythm. 6If the AED recommends that you deliver a shock to the person, make sure that no one, including you, is touching the person – and tell everyone to "stand clear." Once clear, press the "shock" button. 7Begin CPR after delivering the shock. Or, if no shock is advised, begin CPR. Perform 2 minutes (about 5 cycles) of CPR and continue to follow the AED's prompts. If you notice obvious signs of life, discontinue CPR and monitor breathing for any changes in condition. To see the steps to use an AED performed, watch our video Using an AED. 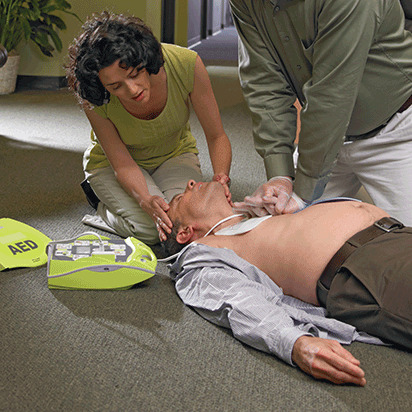 Or, for online, in person and blended training courses, visit our AED training page.